13 Fun Halloween DIYs to Make Your Wardrobe Spooky! October is finally here, and now it’s time to celebrate the best time of the year: Spooky Season! To get into the spirit of things (wink wink, nudge nudge), I’ve compiled a list of some fun crafts and DIY projects that are perfect for any skill set. Just pick any project(s), and you’ll instantly elevate your wardrobe to be Halloween-ready! Craft stores this time of year hold a wealth of cool Halloween goodies, and these goodies can be used to create some awesome, unique pins and brooches. If you take a look at the full selection, you can find a ton of bits and bobs to use in your creations. Try different kinds of pin backings and items until you’ve come up with a combination you like best. make sure to use strong super glue, like E6000 or Gorilla Glue, to secure your pieces together. Then wear your creation proudly! This one was inspired by a DIY video by YouTuber Annika Victoria, who’s made patches before using a sewing machine, fabric glue, and iron-on transfer sheets. Start by picking a simple design you can sew, such as a cobweb pattern, a ghost, or a skull. Use a corresponding piece of broadcloth, measure out your desired size, and get cracking. I recommend iron-on transfer sheets like Wonder Under or Heat & Bond. Follow the instructions on the transfer sheet to secure your patch to the elbows of a sweater, to a jacket, or to a basic t-shirt. If you’ve been following my Instagram, Twitter, or Facebook, you may have seen the teaser images for my recently-made Halloween dress. No matter what kind of seamstress or tailor you are, if you’ve found a good pattern and cute fabric, you can make an awesome dress to wear all season long. A post about this particular dress will be up in the near future! This project does not require any intense DIY skill set–all you need is an iron, and maybe some hand sewing skills. Gather together some spooky and Halloween-themed pins, buttons, and patches, and place on a denim jacket (or another type of jacket you like). You can even theme the items on your jacket depending on your taste, i.e. horror movies, monsters, bats, etc. This weekend, I'm finally decorating for Halloween and I'm sooooo happy 👻🎃🦇 Here are some of my favorite Halloweeny pins right now! Makers are tagged cuz everyone needs a spooky collection! Just grab some glue and the necessary components, and you can have yourself a pair of spoopy cufflinks for you or a friend. Find an image you like, a metal tone that suits you best, then simply assemble! If you love to embroider, and you love to wear collared shirts, then adding some flair to a collar can elevate an outfit from mundane to Samhain! Icons like bats, cats, and spiders will add that certain something to an otherwise boring shirt, and a subtle, festive effect to your wardrobe. 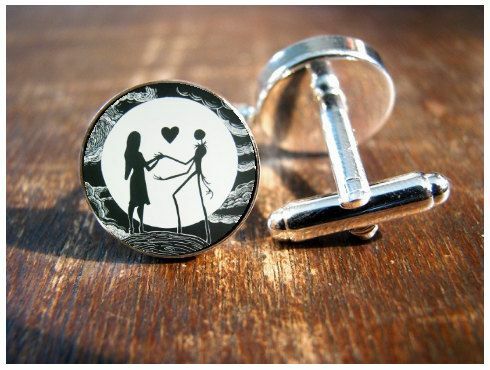 Want an accessory to go with your newly-made cufflinks? Then consider a bowtie that has batwings! You can sew a full-on bowtie, or make a pre-tied one for a simpler DIY. This is a project that I often fall back on. It’s a super easy sewing project for beginners, which yields cute results. I’ll link my tutorial for a Halloween-themed one I did last year! 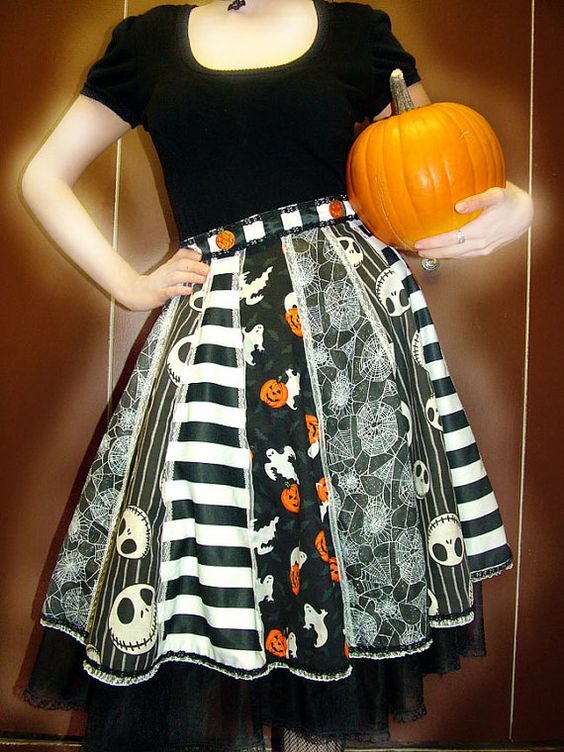 Take some Halloween-y fabric, a basic skirt pattern of your choice, and make a comfy skirt for the season. There are a ton of skirt patterns available on Pinterest, so just find the right skirt for you. October means chilly weather for many, so it’s best to bundle up during this time of year. So why not take a super comfortable hoodie and add some bat wings to it? If you like making jewelry, and Halloween, then this project is for you! Using Halloween-themed charms and findings, create an accessory that you can pull out year after year. And, if you’re not too keen on making your own jewelry, you can add to an already-made necklace. If you’ve got a few hours on hand, and you love to paint, then this is the right project for you! Simply pick up a black sweatshirt or tee, fabric paint, a ruler, and something to mark the garment with (I used tailor’s chalk). Also, have a reference picture handy! The most important step is finding the dead center of the sweatshirt, which you should mark with a long, parallel line. From there, create 13 perpendicular lines (13 because you will draw 12 ribs on either side in between these lines), sketch the rib shapes, then outline with fabric paint. Fill in the outlines with paint, and let dry overnight! 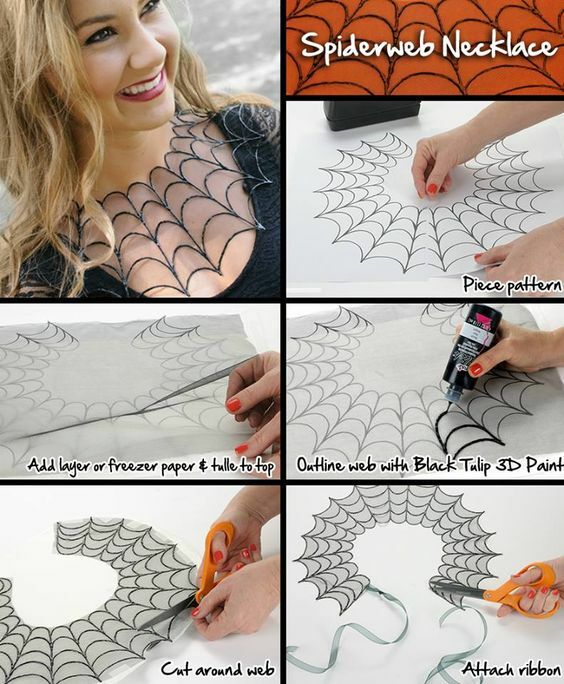 For extra spook factor, outline or fill in the white bones with glow-in-the-dark paint. This would also be a great, comfy costume, especially if you make a coordinating pair of skeleton sweatpants! So which craft was your favorite? What are you DIYing this Halloween season? Let me know in the comments below! I’m always down for crafting (lol) this time of year, and Halloween will always be my favorite DIY season. And don’t forget to follow my social media to see such DIY progress IRL! Also, if you’re in the mood for more spoopy content, check out the rest of my NERDIWEEN posts! And for extra spoop, check out my Everyday Halloween Pinterest board! Thanks! I can see you doing some of these! Love all of these projects!!! Makes me want to make a bat bow tie real bad! I have some of the fabric that you made your dress out of, and after seeing how cute it is I regret not buying more! I like that jean jackets are coming back into style. It’s a great thrift find and pins would be a great way to decorate a jacket. These are all such great DIYs! Love the brooches, earrings, and collar embroidery. Just that little pop of festivity – love it! yes! those are probably my favorites because they’re easy, and add great flair to an outfit.